If you want a ready-to-go packet of worksheets for the entire memoir Farewell to Manzanar (including one related poem by Dwight Okita), you will love my collection of 10 guided reading worksheets with answer keys that I created and currently use for my English II class (I believe they would be appropriate for any grade from 8-11). 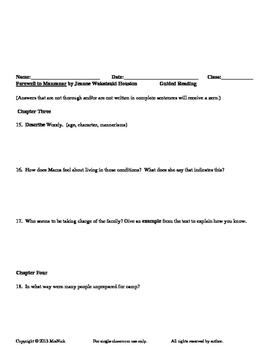 This file contains 10 guided reading worksheets that require detailed answers to questions throughout each chapter, as well as vocabulary from several chapters. These worksheets are very versatile and I have used them seven times now, and I have updated these worksheets every single year. The students can work alone or in groups. The questions can be answered aloud by the class or quietly by each individual. They can be given to a class that has a substitute teacher. They can be graded after class by the teacher or graded together as a class. I always review with the class to make sure everyone has the correct answer after I hand back their graded worksheets. I see my classes every other day for 70 minutes and I do send homework home, so it took me one quarter to complete with my class. However, a class that meets every day may finish in a timelier manner. All guided reading worksheets were created by me using Microsoft Word, are copyrighted and intended for single classroom use by a single teacher. The guided reading worksheets make up 22 pages of the file (spaces are included for student answers), while the answer keys make up 16 pages (without unnecessary spaces). 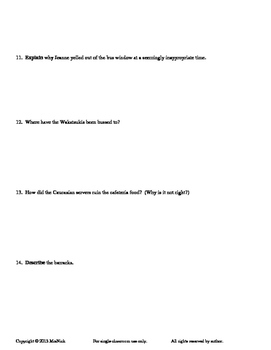 Questions that pertain to a poem are taught with this unit, but I may not reprint the poem. You will have to find copies of it on your own. All materials were aligned with new Common Core State Standards over the past year. Careful consideration of DOK was used when creating each question, resulting in a variety of DOK questions. 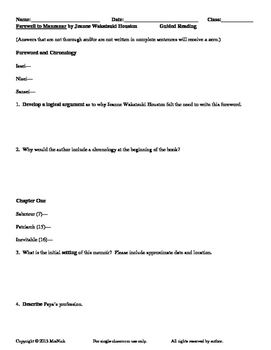 All worksheets were used to create the Unit Test (available separately at the MrsNick store). Page numbers are from ISBN 0553272586 (orange copies and black and white copies, both paperback and hardback).